Although it may not be as prestigious as winning an Oscar, topping a year-end chart for most popular Applications on the Apple iOS is a pretty remarkable feat. One hint about the #1 spot for 2013, it wasn’t even on the list last year – and if you can’t figure it out from there, you probably don’t pay too much attention to what the most popular Application has been pretty much all year long. The crown belongs to none other than Candy Crush Saga, and congratulations to them, it’s not often you see a single app dominate the charts as long as Candy Crush has been able to. YouTube, which was the winner last year, fell to the #2 spot – which is still respectable, but I don’t think Google should be satisfied with the 2.5/5 average rating. Besides Candy Crush, there were only two other games to make the list this year (which is actually an increase from the two total in 2012), Temple Run 2 and Despicable Me: Minion Rush. TR2 landed the number three spot, an increase from Temple Run 1’s #7 rank a year ago. Minion Rush just barely made the list at #10, but that’s really impressive to see a movie branded game make it a year-end top 10 list. Last year, we saw the game Draw Something at the #3 spot, but clearly interest for that game is nowhere near as high as it once was. As you can see, the rest of the list is populated by various Social Media oriented applications – to me, that makes this list a little less interesting. 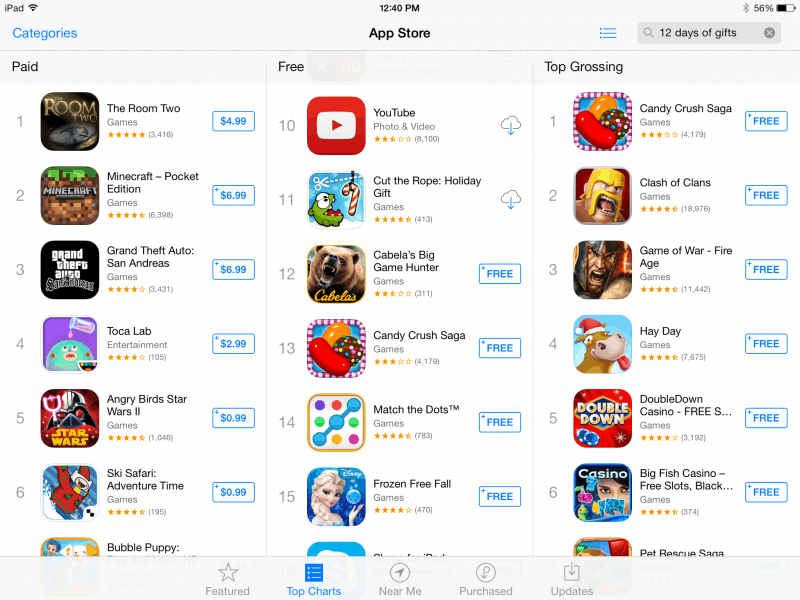 Fortunately, Apple also released the Top 10 Paid apps, which is a tad bit more interesting! Keep in mind, this list is strictly for iPhone users, as opposed to the previous list which is simply a combination of paid, free, tablet, and phone downloads. It’s not too surprising that Minecraft topped the paid list, like Candy Crush, I saw this on the charts very often throughout the year. Plants vs. Zombies managed to squeeze into the #10 spot, which I was happy to see, since that game has actually been around a long time and was able to stay popular and relevant over several years. – Candy Crush Saga has been ridiculously dominant throughout 2013, will the developers at King be able to continue this success? – There were only four applications that remained on the Top 10 list in 2013 that were previously ranked in 2012, how many will remain on the list in 2014 and which ones will fall short? – Minecraft was uncontested in topping both the Paid apps for iPhone and iPad, and continues to gain success and popularity throughout the world, will there be a surprise hit in 2014 that can contest the ever popular Minecraft? – Twitter and Pinterest are two major social media outlets that were on the list in ’12, but didn’t make it this year, if the pattern continues, Instagram, Pandora, and even Facebook could be next.